You may well have seen these courses as you travel home from the parks. Although we always put them on our “must do” list for our next visit it was several visits after our initial sighting that we actually visited them. 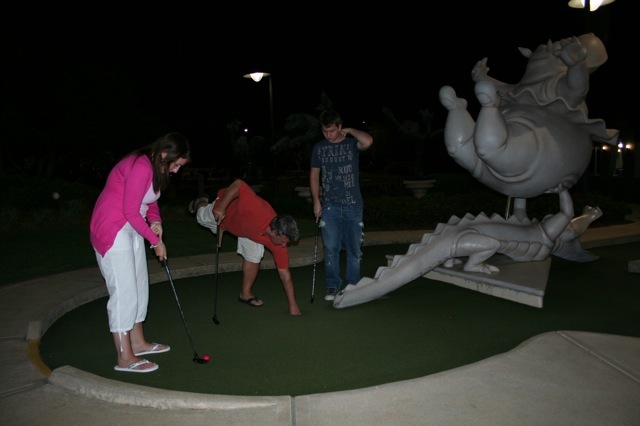 Walt Disney World opened Fantasia Miniature Golf, that consists of Fantasia Gardens, "The Hippo-est Golf Around, " and Fantasia Fairways, "A Miniature Golfing Adventure. " in 1996 These two courses are behind the WDW Dolphin on Epcot Resorts Blvd. In the Starter Shack at the Gardens you can find a snack bar and arcade, cashier for the golf course, and souvenirs. They are open daily from 10 a. m. to 11 p. m. (Last round on Fairways starts at 10:30 p. m. ). To play costs approx $14 for adults and $11 for children aged 3-9. We have never had enough time for a second game but I believe there is a fifty per cent discount on these if they are played on the same day. The best way we found to get to Fantasia Gardens was is to either walk from the Epcot resort area, or to drive. If you are going by car and travelling west on Buena Vista Drive from Downtown Disney you turn right at the second Epcot Resorts Boulevard traffic signal. However if you are travelling east from World Drive, on Buena Vista Drive, turn left at Epcot Resorts Boulevard traffic signal. We decided to have an evening at Disney's BoardWalk Resort so we cut through the resort lobby to the Boardwalk. We then turned left and continued to the end between Atlantic Dance and Jelly Rolls Piano Bar. Then across the bridge toward the Walt Disney World Swan and Dolphin and straight ahead to the street. Fantasia is on the left and the tennis courts are on the right. Apparently although we have not tried it you can also get to Fantasia Gardens by taking WDW Resort transportation to the Dolphin, followed by a short walk from the hotel. If you take a boat to the Dolphin, go through the hotel to get to the parking lot entrance and it is across the street from here. 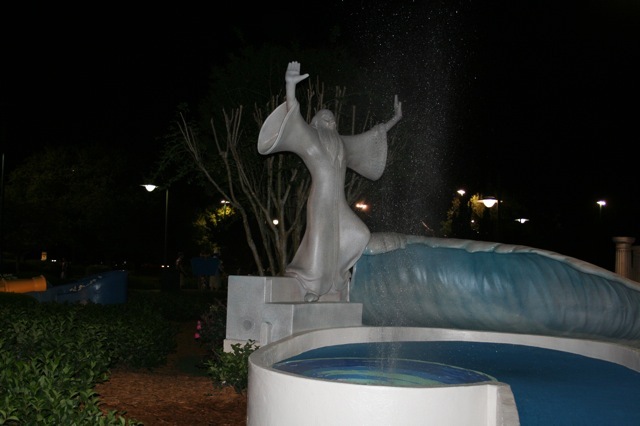 The Fantasia Gardens have pirouetting gators, tutu-clad hippos and dancing water fountains! You play your way through five musical sequences from Fantasia. Not being experienced golfers we always play this course that is best suited for families and novice golfers. The holes have names like Toccata and Fugue (if you play a good shot you hear musical tones), The Nutcracker Suite (obstacles include dancing mushrooms). The Pastoral Symphony (you need to see the waterfalls here), and "The Sorcerer's Apprentice, " starring Mickey Mouse, his troop of out-of-control broomsticks and dazzling water effects. More serious golfers play the Fantasia Fairways. This has challenges with exaggerated contours, menacing water hazards and diabolical sand traps. The layout combines par-three and par-four holes ranging in length from 40 to 75 feet. Par is 61 and covers 1, 445 feet. The holes on this course include Ave Maria, Legend of Yen Sid, Rite of Spring, Ostrich Island and Ballet of the Bunkers. I am sure if you go to Fantasia Gardens you will enjoy it. We visited at the end of the day, as it is getting cooler, it really is a lovely place to spend the evening. Viewed 7880 times since 1 September 2008. Walt Disney World Railroad………….All Aboard!